The first Europeans came to the township to settle the land in the early 1820’s. It was not an easy life they found. There were few roads through what was then wilderness. In 1825, a trip between Detroit and Ann Arbor would take more than two days. One early author described the area as "a dense unbroken wilderness teeming with wolves, bears and deer." Dysentery and malaria were constant threats and few medical services were available. But it was good land and the area began to grow and prosper. The farmers were not the original inhabitants of the area. Tribes of Native Americans walked and farmed southeastern Michigan and canoed the Rouge before white settlers arrived. Indian legend has it that the tribes of the Three Fires – Odawa, Pottawattami, and Ojibwa – gathered to trade and hold tribal meetings near the mill where Tonquish Creek and the Rouge join. Several Indian trails crossed where Nankin Mills is located. Nankin Mill construction began in 1835 but was abandoned for some reason when partially completed. In 1842, a new owner took over the mill and completed the work and gristmilling began. Sometime around that period, an overshot wheel was constructed to power the mill. Nankin Mills does not sit directly on the Rouge River and in order to operate the wheel, water had to be diverted from the Rouge. The Rouge was also dammed so that a reliable supply of water was available during the dry summer months. How was water used to supply power to the Nankin Mill? At one time, an overshot wheel supplied the power, but by the time Henry Ford purchased the mill in 1918, that wheel had been long removed and a turbine wheel, underneath the mill and hidden from sight, was being used. More information on grist mills can be found here. Nankin was a growing township by the time the mill was operational and local farmers who were growing grain had need of the mill’s services. A thriving community later called Pike’s Peak grew up across from the Nankin Mills. Among its businesses were a blacksmith shop, printing shop, and a post office. Today, several of the homes from that town remain. There are rumors that escaped slaves sometime in the early 19th century may have been hidden near the mill and perhaps even at the Mill during their journey along the Rouge to the Detroit River, Canada and freedom. There is even unsubstantiated stories that the mill was burned because it served as a station on the Underground Railroad. The possibility exists since the home of Marcus Swift, a local minister and active abolitionist, was said to have burned down around that same period for that same reason. Sadly, the truth may never be known as no written records were kept. Aiding a runaway slave was illegal and those who aided in an escape could lose their property. For this reason, few were willing to talk of their activities much less put their stories on paper. The present mill is the second mill near the site and much of the building dates from around 1863, although Henry Ford did some substantial remodeling when he purchased the mill (see section below). In fact, the massive hand-hewn sycamore beams used in its construction can still be seen. In 1887, the mill changed hands and the new owner, Martin Lewis, replaced the overshot wheel with a more efficient turbine water wheel. This wheel was built under the mill. This change meant that the water of the Rouge River now had to run directly underneath the building and then out the other side. Today, the mill race that carried water to the mill and the tail race taking water away from the mill can still be seen. Nankin Mills is said to have been a favorite place for Henry Ford to visit during his boyhood. Ford would join his father, a farmer, for the journey to the mill by wagon along Ann Arbor Trail, which fronts the mill. 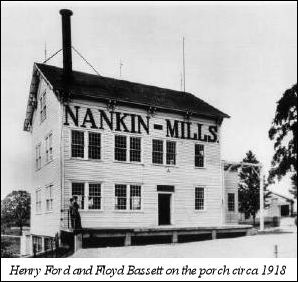 In 1918, the now-famous automaker decided to purchase Nankin Mills from Floyd Bassett, the last miller and convert it into a small factory Ford made major changes to the mill, but worked hard to maintain the integrity of the old building. When the floors were installed to support the heavy machinery, Ford required that tongue-and-groove hardwood floors be installed and that wooden pegs be used to fasten the planks to the supporting beans, a method that was used around the time of the Civil War. Those floors can still be seen today. Ford also bought the Millers house, and had Edward J. Cutler, the architect who supervised Ford's restoration projects, restore the miller’s (tenant) house just west of the mill (see photo at left) as a gift to the architect and his family. Cutler worked on most of the buildings at Greenfield Village in Dearborn. Ford’s conversion of old mills like Nankin into factories was part of his Village Industry project. Ford saw small towns like Pike’s Peak (an early Nankin Mills area community) declining as people abandoned the land for jobs in Detroit and Highland Park with its flourishing auto plants. By establishing a number of small auto factories in rural areas Ford felt that these small communities would once again thrive. Farmers would be able to farm during the summer and once cold weather set in, be able to work at the mills. Ford originally chose the grist mills for his factories so that he could harness the same water power that had once helped turn corn and wheat into flour. The water that turned belts and a grinding wheel would now turn turbines and produce hydroelectric power. However, water wasn’t a reliable source of power due to seasonal changes in water level and Ford eventually turned gas generators and then the local utilities for electrical power. During the period that the plant did produce its own hydroelectric power, wires were run to the houses in Pike’s Peak and families received free electricity making Nankin Mills one of the earliest public utilities and Pike’s Peak one of the first rural communities to have electric lights. 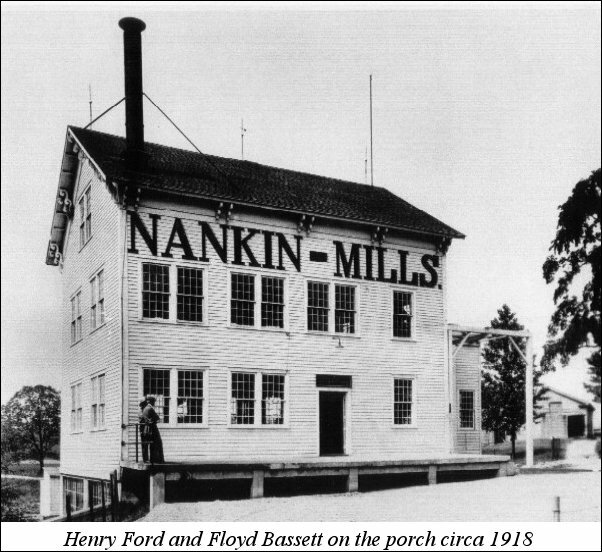 In 1921, Nankin Mills began producing screws for the Ford Motor Company. In 1937, the mill was retooled for the production of stencils for marking Ford parts. It was also retooled for engraving work at that time Those stencils were used on all Ford Parts produced up to 1948. The lettering on these stencils ranged from an almost microscopic size to several feet tall for signs & trucks. In 1948, Nankin Mills was donated to the Wayne County Road Commission, which owned the Middle Rouge Parkway surrounding the mill. The stencil-making operation moved to the Waterford village industry plant not far away. 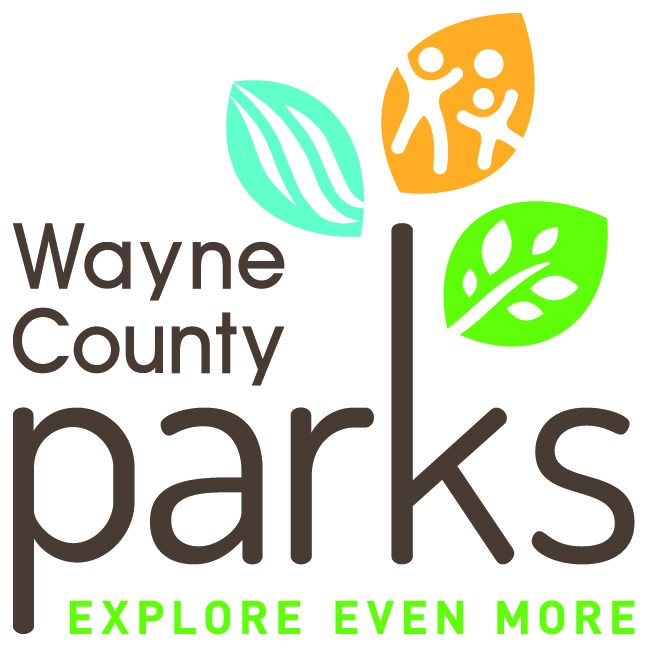 Nankin Mills was remodeled by Wayne County and dedicated in 1958 as a nature center. The Nankin Mills Nature Center under naturalist Mary Ellsworth was a popular visiting place for children and adults alike, featuring exhibits on history and live wild animals and livestock. It closed in 1979. The Nature Era that looks at the Rouge River eco-system. The Native American Era shows how Native Americans lived here before the coming of the European settlers. The Village Industries Era explains how Henry Ford sought to provide people with a place to work and still live on their farms. The mill has since been chosen as a gateway hub to the MotorCities-Auto National Heritage Area. It is one of six such gateways in Metro Detroit. MotorCities National Heritage Area is affiliated with the National Park Service. Looking Back: Marcus Swift and the Underground Railroad in Nankin Township: Marcus Swift was a early settler in Nankin Township. He was also a community leader, preacher and ardent abolitionist. "My Recollections of Pioneers and Pioneer Life in Nankin", as published by the Michigan Pioneer and Historical Society in 1908. Melvin Osband, nephew of Marcus Swift, one of the first white settlers in Nankin Township, came to this area as a baby in 1826 . In his recollection of growing up in Nankin Township, Osband remembers Nankin Township "with dense forest in every direction and the howling of wolves sometimes made night hideous. Yet, he also mentioned that his uncle and other family members settled the land because they thought it was as "near to paradise as any locality they were likely to find." Osband said that when his father settled, the nearest neighbor was three miles away and by 1835 there were 12 within a mile. 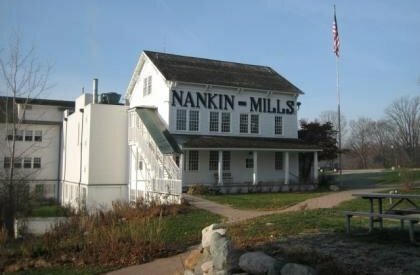 The following articles are part of a series called Nankin Mills: Past & Present and relate the history of Nankin Mills. They are reprinted by permission from The Nankin Historian, a bi-monthly newsletter that tells through words and photos the fascinating story of Nankin Township. The newsletter is available through area museums, local libraries or by contacting Managing Editor Daryl A. Bailey at the NankinHistorian. The Friends of Nankin Mills are thankful to Daryl for allowing us to share these stories. The Tribes of the Three Fires: They called themselves the Three Fires. They were the Ottawa, the Potawatami and the Ojibwa. Westland might have been where they once held their tribal meetings. 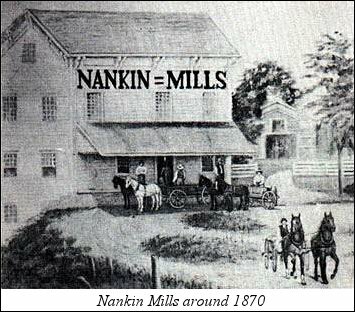 Getting Grain To The Mill: Nankin Mills has a long and colorful history. What follows are accounts written by Melvin D. Osband, the son of an early pioneer, in his "My Recollections of Pioneers and Pioneer Life in Nankin" as published by the Michigan Pioneer and Historical Society in 1908. Nankin Mills and the Underground Railroad: What was the Underground Railroad and was Nankin Mills a part of it? Mary Ellsworth: Mother of the Nankin Mills Nature Center: Almost anyone who grew up around Westland in the mid-1960's visited the nature center that used to be at Nankin Mills. And they got to know Mary Ellsworth who was the heart of the center. Here's a little information about a very special woman. Henry's Hobbies: Henry Ford developed small factories to produce parts for the Ford Motor Company. They were called Village Industries and were also known as one of Henry's hobbies. Nankin Mills was one.